This article examines how research on literature was integrated into Section VI of the École pratique des hautes études (EPHE) over time, showing how research shifted from the sphere of sociology to the burgeoning pole of specialists on literature and the arts formed around semiology and various appropriations of structuralism. Analysis of literature’s role as a research focus in the school also reflects the transformations of disciplinary subdivisions inscribed within broader trends in the academic field. The initial connections between promoters of the so-called “internal” and “external” approaches to literary texts bring nuance to the oppositions between these approaches and shed light on some of the mechanisms of their gradual split. Lastly, by situating these small groups of lecturer-researchers (enseignants-chercheurs) in academic and intellectual spaces, I offer a refined general understanding of some academic specialization rationales. L’article interroge les modalités d’intégration et l’évolution de la recherche sur la littérature à la VIe section de l’EPHE, en montrant comment elle passe de la sociologie au pôle de spécialistes des lettres et des arts qui se constitue autour de la sémiologie et de diverses appropriations du structuralisme. Le suivi de l’objet littéraire dans l’établissement permet également d’observer les transformations des découpages disciplinaires et d’inscrire celles-ci dans l’évolution du champ académique à la même période. Les proximités initiales de promoteurs d’approches dites « internes » et « externes » des textes littéraires permettent de nuancer les oppositions entre ces approches et de saisir certains mécanismes de leur séparation progressive. La réinscription de ces petits groupes d’enseignants-chercheurs dans les espaces académiques et intellectuels contribue enfin à la compréhension plus générale de certaines logiques de spécialisation académique. El artículo interroga las modalidades de integración y evolución de la investigación en literatura de la sección VI de la EPHE. Se muestra cómo se pasa de la sociología a un polo de especialistas en letras y artes, constituido alrededor de la semiología y de diversas apropiaciones del estructuralismo. Seguir este objeto literario, al interior de este establecimiento, también permite observar las transformaciones que se producen en la división disciplinaria y situarlas en la evolución del campo académico en ese período. La proximidad inicial de promotores de las llamadas perspectivas “internas” y “externas” de textos literarios, permite matizar las oposiciones entre estas perspectivas y aprehender ciertos mecanismos de su progresiva separación. La reinscripción de estos pequeños grupos de profesores e investigadores en espacios académicos e intelectuales contribuye, finalmente, a una comprensión más general de ciertas lógicas de especialización académica. 1.1. The EPHE’s Section VI: Academic Distinction, Disciplinary Indistinction? 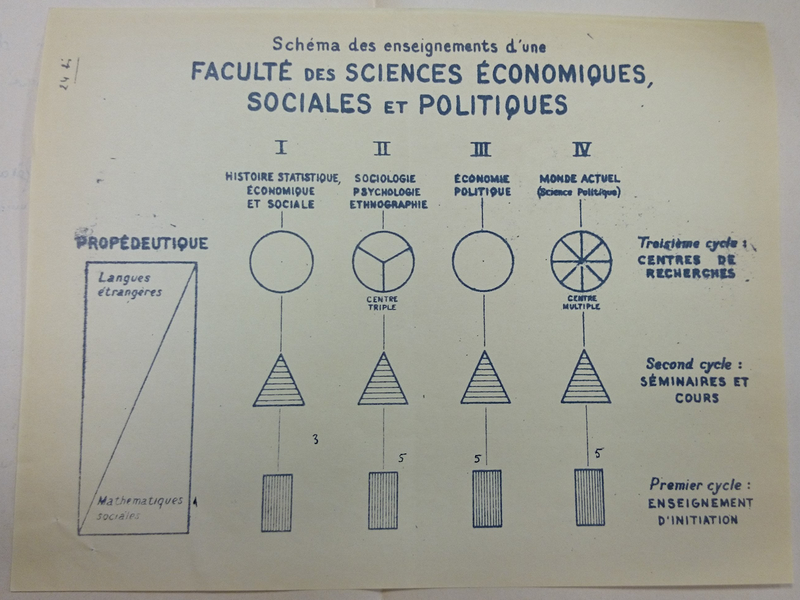 Source: EHESS Archives, Louis Velay papers, file “Projet de création d’une Faculté des sciences humaines et sociales (juin 1958)”. Although it was initially dedicated to the “Economic and Social Sciences,” Section VI (roughly the equivalent of a department) of the École pratique des hautes études (EPHE) is known for being one of the institutions where research on literature was conducted1. It was the locus of the emergence of literary theories that developed in the wake of structuralism as well as the cradle of a number of sociological approaches to literature and the arts. The reception of some of these studies has contributed to entrenching the oppositions between the so-called “internal” and “external” approaches to literary works. This article examines how studies on literature fit within the disciplinary regimes of the EPHE’s Section VI, in an effort to understand how they shifted from sociology to literary theory based on structural linguistics and semiology. In the process, they left behind a speciality—the sociology of literature—within a discipline—sociology—to instead follow a trajectory that may qualify as a “‘regression’ into professional purity” (Abbott 2001: 146). Here the concept of “disciplinary regime” reflects a twofold approach to the “disciplinary division of intellectual labour” (Heilbron 2004; Lamy & Saint-Martin 2011). First, it draws attention to the fact that disciplinary divisions are privileged instruments for the regulation and governance of intellectual and scientific output. Second, it emphasizes the temporal nature of these disciplinary divisions, reminding us that disciplines, as “relatively stable academic units” (Convert & Heilbron 2005), routine “frameworks of perception” of scientific activity and “institutional frameworks” for the organization and reproduction of knowledge (Godechot 2011), are not set in stone. For a better understanding of how studies on literature shifted from sociology to other disciplinary regimes, two levels of analysis need to be considered. The first is that of the school, whose “marginality,” “particular circumstances,” and “specificity” are regularly highlighted both by the institution itself and in the literature about it, sometimes to the detriment of the consideration of continuity between its evolution and that of the academic field. This study covers a period beginning in 1956, a year marked by the Caen conference on higher education and research and the beginning of Fernand Braudel’s stint at the head of Section VI, and ends in 1975, when Section VI became the École des hautes études en sciences sociales (EHESS). This period was characterized by growing numbers of students and teaching staff and the gradual affiliation of classes to a variety of disciplines, a process known as “disciplinarization.” The EPHE relied on both research centres and seminars aimed at postgraduate students and researchers, and presented itself as an “erudite institution” as opposed to places for “pure teaching” (Karady 1976). The seminars informed students and contributed to their recruitment, aligning with or straying from the disciplinary labels then circulating in the academic field. This paper draws largely on the study of the titles given to directeurs d’études (Directors of Research) and seminars, listed in Section VI’s directories, published in 1956 onwards. The second level of analysis focuses on how Section VI adjusted to the transformation of academic spaces. Drawing on the institution’s archives, I show that it is necessary to situate Section VI within the academic field and to note its similarities with other non-university institutions such as the Centre national de la recherche scientifique (CNRS) and the Collège de France, where the titles of positions reflect the current state of members’ power relations and professional practices as much as institutional and scientific policy (Feuerhahn 2017). Likewise, the development of specialities and mergers under the banners of sociology or literature and the arts in Section VI can only be understood in light of broader trends in these disciplines. Lastly, the transformations of the institution and of the academic field also make sense with regard to the broader intellectual field, in which the rise of structuralism went hand in hand with specific academic trends. Combining these two levels of analysis helps to explain the displacement of studies on literature in Section VI in two stages: the modalities of their introduction (1956-1966); and the emergence and distribution of rationales of competition and collaboration around literary topics (1966-1975). In 1947, the creation of the EPHE’s Section VI, dedicated to economic and social sciences, was part of a broader post-war dynamic of renewal in scientific and academic institutions. Section VI was born at the instigation of such figures as Charles Morazé and then Fernand Braudel and Lucien Febvre (leading names at the Annales School) and thanks to financial backing from North American philanthropic foundations (Mazon 1988). Fernand Braudel succeeded Lucien Febvre as head of the section in 1956, and kept his post until 1972. Under Braudel’s presidency, the section entered into a partnership with the Association, and subsequently the Fondation pour la Maison des sciences de l’homme (FMSH) in 1959. The Maison des sciences de l’homme (MSH) in Paris began hosting classes, research centres, and libraries in 1970. Lastly, Braudel’s presidency was distinguished by the promotion of interdisciplinary initiatives, including “cultural areas” (aires culturelles) bringing together specialists from a variety of disciplines (Popa 2015). In the French academic field, Section VI was close to the intellectual field, and overall its members had less temporal power than their colleagues situated at the temporally dominant pole of the academic field (Bourdieu 1984). In literature-related domains, it included few holders of the agrégation (a highly selective competitive examination for teachers and lecturers), had ties with international networks rather than national bodies, relied on teaching staff from somewhat modest backgrounds, and promoted new disciplines rather than the traditional humanities. As it did not fall under the collation des grades procedure2, it initially only awarded the EPHE degree. The introduction of a doctorate in literature in 1958 increased its draw. The fact that theoretically no qualifications were required to attend the seminars and that the degree awarded had little value in the academic market led the institution and its members to stick to distinctive postures in the symbolic struggles that rocked the academic field (Kauppi 1996). The hiring of teachers at the school was not tied to disciplinary affiliations. Olivier Godechot has shown that between 1960 and 1965, scholars were likely to be invited to sit on PhD examination panels based on their familiarity with a common topic, and subsequently with the study of the same “cultural area” between 1966 and 1970, rather than because they belonged to the same discipline (Godechot 2011). Yet, while this disciplinary indistinction was both a deliberate policy and an institutional discourse that reflected the Annales School’s approach, a number of social, organizational, and intellectual dynamics manifested distinctly disciplinary rationales and aligned the institution’s transformations with those at work in the field of higher education and research, which prevents us from looking at Section VI as an institution above the fray, entirely “outside the scope of the ordinary laws of academia” (Revel & Wachtel 1996: 22). In 1948, Section VI’s first curriculum consisted of twenty-nine classes divided into six groups: “Methods,” “Orientation and Historical Frameworks,” “Human Societies,” “Economic Activities,” “Civilizations and Civilization,” and “Survey Week.” From 1956 to the 1960-1961 academic year, according to the directories, there were no disciplinary distinctions between courses. The number of courses steadily increased, from forty-one in 1956-1957 to sixty-seven in 1960-1961. They were divided into three clusters from 1960-1961: “Historical Sciences,” “Economic Sciences,” and “Sociology and Ethnology.” The “Sociology and Ethnology” cluster had the most courses (twenty-nine, i.e., 45 per cent), with “Historical Sciences” and “Economic Sciences” tying in second place (seventeen). The three-cluster system was used until (and including) the 1965-1966 academic year, with a few changes—by then, the clusters were named “History and Geography,” “Economic Sciences,” and “Sociology, Ethnology, Social Psychology.” The number of courses continued to increase steadily, but the share of each cluster remained fairly stable—from sixty-nine courses in 1961-1962 to seventy-six in 1965-1966, with thirty-two courses for the “Sociology, Ethnology, Social Psychology” cluster; i.e., 42 per cent of all courses. The initial absence of discipline labels did not mean that disciplinary references were not used at the institution (in research centres, seminars, and by professors and administrative staff), if only because of the key role disciplines played in the careers of lecturer-researchers (enseignants-chercheurs). The need to establish an order between courses, whose number had virtually doubled in a decade, probably partially explains the introduction of disciplinary distinctions. They were far from the result of “natural” groupings, especially considering that the institution defended an intellectual approach that was based on the unity of the human and social sciences, and involved classification struggles that sometimes reflected hierarchies that they would upset or cement. The disappearance of courses without a specified affiliation to a discipline in the mid-1960s was one of the consequences of a double trend towards disciplinarization and the reconsideration of disciplinary boundaries and the rising importance attributed to pedagogical matters. These transformations were not specific to the institution; on the contrary, they appear to have been one of the ways in which the demands placed on the academic field (Cardon-Quint 2015; Chevalier & Encrevé 2006; Drouard 1982; Hauchecorne 2016; Soulié 2012) were “refracted” (Bourdieu 1991). The so-called “Fouchet reform4” of 1966 promoted extreme disciplinary specialization; two years later, the “Faure act5” was intended to establish the conditions for pluridisciplinarity (Dormoy-Rajramanan 2017). Section VI responded by establishing a relationship of complementarity and distinction with the CNRS and the universities, with whom it shared many members6. The school gave a largely pedagogical meaning to its discipline labels. It strongly affirmed its vocation for teaching and research and the seminar model, whose titles and modes of classification differed from the disciplinary distinctions in the name of “cutting-edge research7,” in contrast to the lecture-based form of teaching that prevailed in universities. During that period, several pedagogical initiatives reformulated disciplinary questions and were approached in light of what the universities were doing. These included the introduction of preparatory courses for advanced social science research (EPRASS) in 1965 and of the advanced social science studies degree (DEASS), modelled on the advanced studies degree (DEA8) offered by science faculties. The EPRASS was presented as a course that was unavailable at humanities faculties9, in disciplines that were seldom or not at all taught at- universities (such as social anthropology, sociology, and linguistics). Until 1959-1960, there were no courses specifically dedicated to literature in Section VI. Yet literature was not entirely absent, and was never entirely neglected: Lucien Febvre and Roger Bastide, among others, had repeatedly called for social science and literary studies to be combined. In the 1950s, the number of student dissertations explicitly covering literature was fairly small in Section VI. In 1956, Georges Balandier and Claude Lévi-Strauss were the rapporteurs (external examiners) for a dissertation on Black African Theatre and its Sociological Functions; in 1959, Georges Balandier oversaw another on Duala literature and its social function; and in 1960, Jean-Claude Vernant oversaw Poetry and philosophy in ancient Pythagoreanism. Section VI’s first course dedicated to literature—albeit not exclusively—was introduced in 1959-1960: Lucien Goldmann’s seminar “Sociology of Literature and Philosophy” was classified in the “Sociology and Ethnology” cluster. The sociological approach to literary texts, combined with philosophy, was literature’s path towards an official introduction into Section VI—there was no historical patronage, unlike in academic literary studies, which were structured using a chronological model and inspired by philology and the social history of literature developed by Gustave Lanson10, who was initially close to late nineteenth-/early twentieth-century Durkheimian sociology (Compagnon 1983; Sapiro 2004). Throughout his career, Lucien Goldmann devoted part of his teaching to the sociology of literature. Born in Romania in 1913, Lucien Goldmann was a member of Communist youth organizations before being permanently expelled. Having pursued law studies, he came to Paris in 1934, where he studied political economics, philosophy, and literature. He fled Paris during the German occupation and sought shelter in Zurich (Switzerland), where Jean Piaget introduced him to academic circles. He returned to Paris and joined the CNRS after the war. His doctoral thesis was published by Gallimard in 1955 under the title The Hidden God: A Study of Tragic Vision in the Pensées of Pascal and the Tragedies of Racine (English version 1964). He was elected directeur d’études (DE) in Section VI and 1959 and became the head of the Centre for the Sociology of Literature in Brussels in 1964. He grew closer to the Unified Socialist Party (PSU) during the 1960s and supported the student protests of 1968. He died in Paris in 1970. The Hidden God was Goldmann’s main success. In it he advocated combining “reflection on method” and “practical research.” However, the latter in no way resembled the research conducted by sociologists in his day: he had different areas of research and theoretical interests, was opposed to empirical sociology and involved in the diffusion of structuralism. There was “no contradiction,” he argued, “between a refusal of ‘scientism’ and the desire to attain a scientific, historical and sociological knowledge of facts concerning man, a knowledge quite opposed to speculation and belletristic essay writing.” (Goldmann 1964 [1955:7-8]). Inspired by the works of Karl Marx and György Lukács, Goldmann’s output displayed a heterodox, anti-Stalianian brand of Marxism, opposed to Althusserianism. Goldmann studied “structural homologies” and introduced a mediating level (“world vision”) between social groups and literary works, which placed him at odds with reflection theories. Goldmann applied and discussed his “genetic structuralism” in his studies on literature (Towards A Sociology of the Novel, 1975 ; Genetic Structuralism and Cultural Creation in the Capitalist World, 2007 ) and on cultural production (Mental Structures and Cultural Creation, 1970). Two new appointments contributed to furthering the place of literary studies in the institution’s landscape. The first was André Miquel, born in 1929, an alumnus of the prestigious École normale supérieure (ENS) of Ulm, holder of the agrégation in grammar, doctor of letters, and a specialist of ancient Arabic geography texts. He was a maître de conférences (lecturer) at Section VI from 1964 to 1967, teaching a seminar entitled “Sociology of the Arabic Language and Literature” in 1965-1966, classified under “Sociology and Ethnology.” He was also a translator, and oversaw Arabic language and literature at the Collège de France in the mid-1970s. The second “literary” hire was Roland Barthes, who was elected directeur d’études (DE) in 1962 and who taught a seminar entitled “Sociology of Signs, Symbols and Representations,” also classified under “Sociology and Ethnology”. Roland Barthes (1915-1980) grew up in the South of France and moved to Paris for his studies. He was awarded a master’s (DES) in literature by the Sorbonne in 1939. He was not involved in the Second World War, and was subsequently introduced into Parisian literary life by Maurice Nadeau. Barthes would belatedly call himself a Marxist but was never a member of the French Communist Party (PCF). A research associate in sociology at the CNRS between 1955 and 1959 (Samoyault 2015: 289), he obtained his first permanent position at Section VI, which he joined as a chef de travaux in 1960. Alongside Edgar Morin and Georges Friedmann, Barthes participated in the foundation of the Centre for the Study of Mass Communication (CECMAS) in 1960 and in the journal Communications, a vehicle for the diffusion of semiology, structural linguistics, structuralist approaches to literature and the arts, and studies on cultural topics and the media. With the publication of Writing Degree Zero (1968) and his activity as a literary and theatre critic, Barthes became a figure of the intellectual and literary field, and the success of his Mythologies (1968) exposed his work to a wide audience. He also published in academic journals. In a 1960 paper entitled “History or Literature ?,” published in the Annales, Barthes discussed the works of Marc Bloch, Lucien Febvre, and Lucien Goldmann. At odds with the model of literary history then prevalent at educational institutions, Barthes argued that literary history “is only possible if it is sociological, and if it is interested in activities and institutions, and not individuals” (Barthes 1960: 185). Barthes gradually moved away from this critical dialogue with social science to focus on more specifically literary endeavours. The publication of On Racine (1992) , the ensuing dispute with Raymond Picard, and Criticism and Truth (1987)  turned Barthes into the leading figure of the “Nouvelle Critique,” a label referring to disparate appropriations of structural methods. Barthes continued to conduct semiological studies on literary (S/Z: An Essay, 1975 ) and non-literary objects (The Fashion System, 1967). He was occasionally considered as part of the ill-defined “French Theory” movement abroad. He was elected at the Collège de France in 1977 to oversee “literary semiology.” His later work reflects the central place of literature in his research (A Lover’s Discourse: Fragments, 1990 ; The Preparation of the Novel, 2011 ). Although he was the DE with the most ties to literary spaces, Barthes initially did not teach a seminar on literature. Until the late 1960s, he was not particularly in demand for master’s or PhD dissertations specifically pertaining to literature. The same applied to Goldmann (Table 2). For both DEs, in accordance with the titles of their professorships, literature was neither the sole object of their work nor of their teachings. The “Sociology and Ethnology” cluster, in which these new specialists of literature were placed, became “Sociology, Ethnology and Social Psychology” in 1965-1966 (Table 3). The most prominent post-war sociologists, who were from or connected to the Centre d’études sociologiques (including Georges Gurvitch, Georges Friedmann, and Alain Touraine), had an important role in it and connected it to the sociological work being conducted outside of Section VI. The rise of sociology in Section VI reflected broader trends within the discipline. While sociology was previously a certificate within the philosophy degree, its institutionalization ensured it lasting student attendance in a relatively autonomous curriculum: the licence (bachelor’s) was created in 1958 and the first theses were defended in the early 1960s11. The growth of sociology was also connected with the expansion of universities in the 1960s: the number of PhDs awarded began increasing by the middle of the decade, and so did the number of CNRS researchers—among whom the number of sociologists rose from 50 to 130 between 1960 and 1975 (Heilbron 2015: 152 sq.). Section VI’s staff also expanded. Sociology gained an increasingly prominent place there, branching out into several theoretical programmes. The rise of structuralism was a fairly minor development for sociology, whereas it allowed other disciplines such as linguistics to renew and structure themselves using new epistemological bases. Note: all classes listed in the Annuaires (Directories) are included, except the “Additional Conferences” (conférences complémentaires) and the “Experimental” and “Preparatory” Classes (enseignements “expérimentaux” et “préparatoires”), not held on a regular basis, often identical to main classes and not systematically listed or summarized. See Appendix. 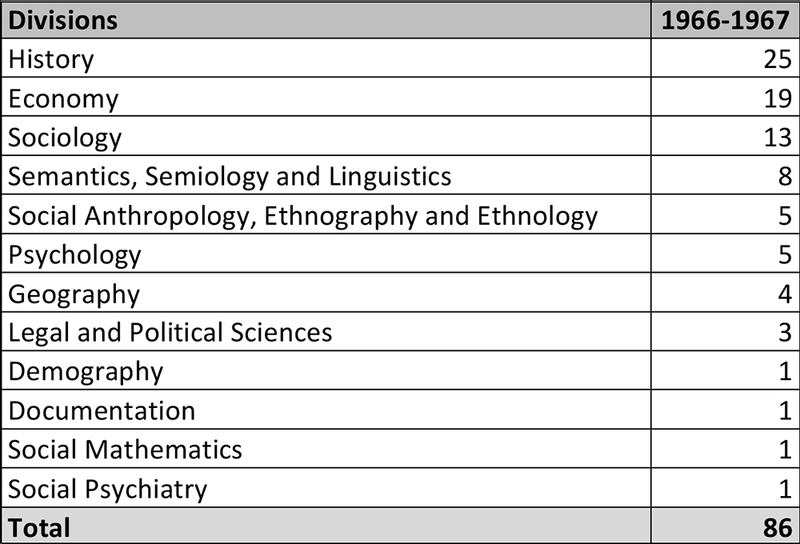 The relative weight and diversity of the “Sociology and Ethnology” cluster decreased in the curriculum when the twelve new discipline subdivisions were introduced in 1966-1967 (Table 4). Several factors go some way towards explaining the new discipline distinctions, starting with the aforementioned transformation of the academic field. Considering the close ties between Section VI and the CNRS, the creation of associate laboratories and research teams in 1966 should also be taken into account, as they favoured and ultimately institutionalized disciplines and groupings of specialists (Picard 1990). The members of Section VI also expressed their “intention to define themselves better in relation to the university system12” as social science expanded in universities and the institution lost its virtual monopoly over training in the related disciplines, which had until then been neglected by faculties of literature. Lastly, the school was forced to depart from the universities’ discipline labels while retaining clearly defined understanding labels of its own that could be converted into resources in the academic field. 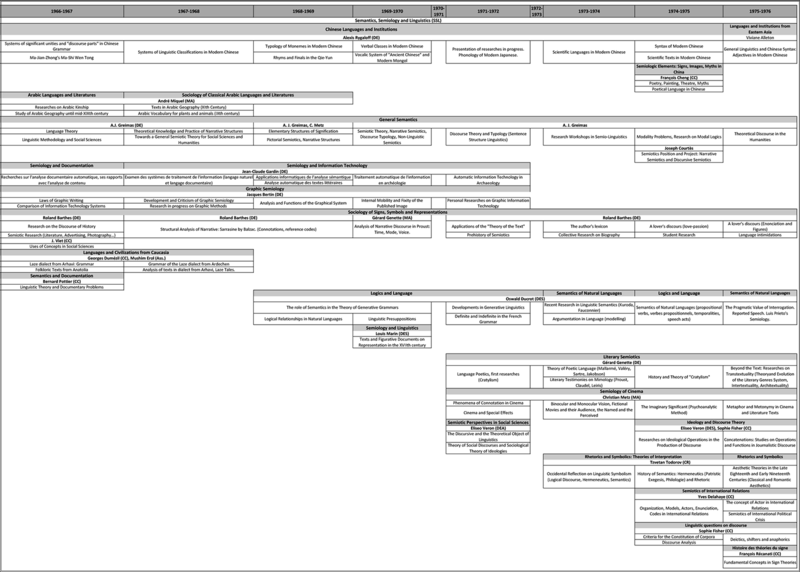 The distribution of “Sociology and Ethnology” courses in the new subdivisions followed existing thematic and methodological lines (Figure 1). Sociology secured the highest number of courses (twelve), all connected to directions d’études (Directorates of Research). More than half of the sociology DE had been taught for at least ten years in Section VI (see Appendix). In quantitative terms, the reassignment of “Sociology and Ethnology” classes into finer disciplinary subdivisions showed that sociology alone did not cover the entire “Sociology and Ethnology” cluster, but rather served as a unifying label masking the scattered nature of the “refuge discipline” at the time (Bourdieu 1980: 19; 1984: 159). The modalities of this reassignment reveal the key role of the teachers’ seniority and grade in the imposition of a speciality, subdivision or discipline. Indeed, not a single subdivision was without a DE. Those containing only one course involved longstanding members of the institution and/or holders of positions of power in the academic field. Lastly, disciplines tended to be increasingly divided up between several labels spearheaded by key figures in various research fields (Lévi-Strauss for anthropology; Friedmann and Touraine, among others, for sociology; Barthes and Greimas for semiology). One of the new labels stood out: “Semantics, Semiology and Linguistics” (SSL), in which none of the most senior members of “Sociology and Ethnology” was involved. Out of the three teachers from that cluster active in the new subdivision, Barthes was the only DE: André Miquel was a maître assistant (assistant lecturer) and Georges Dumézil—a professor at the Collège de France—was a chargé de conférences extérieur (guest lecturer). The SSL subdivision featured solely recent recruits of “Sociology and Ethnology.” Yet its place among the new subdivisions was notable—in terms of staff size, it came fourth behind history, economics, and sociology. It included two of the three specialists of literature at the school13. However, SSL was not the only venue hosting researchers with an interest in literature, since Goldmann remained affiliated with sociology. The emergence of a network of scholars specialized in literary and artistic themes contributed to the formation of disciplinary groupings and speciality. Gaëtan Picon, whose seminar on the “History of Conscience and Literary Objects” began in 1966-1967 at Section VI, was affiliated to the history subdivision. Gaëtan Picon (1915-1976)’s opposition to the theoretical avant-garde was probably one of the reasons why his role was overlooked in the historiography of 1960s intellectual life, although during that time he was situated at the intersection of the literary, artistic, and academic fields. Born into a family of Bordeaux industrialists, a holder of the agrégation14 in philosophy, an activist in the socialist youth movement and in the Popular Front, Picon, a former student of Gurvitch, was close to André Malraux, who appointed him as director-general of arts and letters in 1959. He ended his political career in 1966—the year he was elected as DE in Section VI with Goldmann’s and Lévi-Strauss’ support. He began teaching at the Paris school of fine arts and pursued a parallel international career. He worked for several publishing outfits (Mercure de France, L’Éphémère, Skira’s collection « Les Sentiers de la création ») and wrote on literature (André Malraux, 1945; Georges Bernanos, 1948; Panorama de la nouvelle littérature française, 1950; L’Usage de la lecture 1960-1963) and art criticism (including articles and books on Ingres, Picasso, Dubuffet, Cézanne, and surrealism). He was close to the literary criticism of the Geneva School15 and to the poets Yves Bonnefoy and André du Bouchet, and approached literature through the perspective of modernity and the subject as creator. He died in 1976 when he was due to become the next director of the Académie de France in Rome (Callu 2011: 519). The presentation of Gaëtan Picon’s 1966-1967 seminar describes an examination of novelistic and autobiographical narration in the first half of the nineteenth century that places the subject at the centre of literary works. The following year, he considered the “modern notion of art and literature16” based on texts by Baudelaire and lectures by Jean Starobinski and Yves Bonnefoy. In the early 1970s, Gaëtan Picon’s teachings proposed a historical approach to structural questions. He then worked alongside Marc Soriano, a holder of the agrégation in philosophy, a former student of Jean Piaget and the author of a PhD thesis on Charles Perrault’s fairy tales. On examination panels for master’s and doctoral theses, Gaëtan Picon often sat with Pierre Francastel, specialist in the sociology of art, Jean Cassou, who began co-teaching the seminar for that speciality with Francastel in 1965-1966 and went on to teach his own seminar on “Social Conditions and the Spirit of Surrealism” in 1968-1969, and Barthes and Goldmann. Picon evaluated a dissertation on Marc Chagall supervised by Jean Cassou in 1968 alongside Francastel, and one on “writing and painting” also supervised by Cassou, in 1969, with Barthes. The same year, Cassou and Picon evaluated a dissertation on existentialism and Marxism in Paul Nizan’s work, supervised by Goldmann, and Picon and Algirdas Julien Greimas evaluated another on Franz Kafka, supervised by Barthes. Their joint presence on examination panels illustrates several trends, namely: the formation of a network of specialists on literary and artistic themes across the new discipline boundaries; the increasing number of works on literary and artistic themes and the diversification of approaches; as well as the relative scarcity of specialists of literature and art in the institution, leading them to collaborate in spite of their different approaches and discipline affiliations. The teachers active in that network also included two sociologists: Georges Friedmann and Pierre Bourdieu. Friedmann, then important in French sociology, and whose direction d’études on the “Sociology of Labour” tellingly became the “Sociology of Labour and Leisure” in 1961-1962, teamed up with Barthes to supervise studies on mass culture, the press, and the media until the early 1970s. He then supervised a dissertation on the “poets’ circle in Québécois society”, with Jean Cassou and Jacques Berque sitting on the examination panel. These collaborations echoed the engagement of Barthes and Friedmann in the CECMAS and the journal Communications. Literary and artistic themes were also prominent in Pierre Bourdieu’s sociology of culture. In 1969, he was the external examiner for of a dissertation supervised by Pierre Vilar entitled “Class Struggle and Pictorial Output,” alongside Goldmann. In 1970, he was the third external examiner for a dissertation supervised by Goldmann on “Madame de Staël and the origins of the sociology of literature in France,” alongside Robert Mandrou and Jean Cassou. However, unlike Goldmann, Bourdieu did not focus only on literature—he had a broader interest in “culture,” to which the contents of the early years of his seminar and the evolution of literature in his own work attest. The 1965-1966 seminar on the sociology of culture was devoted to the relations between “systems of education and systems of thought” and the production, reception and diffusion of “culture” and artworks. Regarding literature, the presentation mentions a lecture by Jean-Claude Chamboredon on the “social conditions of the creation and diffusion of literary works.” In 1966-1967, the seminar focused on the “critical examination of ethnological and sociological studies pertaining directly or indirectly to the diffusion of culture, and of literature in particular17” for the purpose of “identifying some of the conceptual schemes that are indispensable for the development of a theory of cultural diffusion18.” Lectures addressed various topics (health, teaching, etc.). The uses of the concept of culture in sociology were discussed, based in particular on the writings of Raymond Williams. The diffusion and reception of culture was presented as the main research focus of the group of researchers and of the seminars held in the following years. Like symbolic goods as a whole, literature had a prominent place in Bourdieu’s work at a very early stage, but it only became a distinct obbject of inquiry at a later point (Martin 2010). In the late 1960s, Bourdieu began relying heavily on literature in his effort to construct and formalize the concept of field (Bourdieu 1966, 1971, 1975; Sapiro 2017). Distinction (1979) examined reading as a cultural practice. In the 1980s, Bourdieu’s body of writings on literature expanded (e.g., Bourdieu 1984, 1985, 1991), leading up to the publication of Rules of Art in 1992. 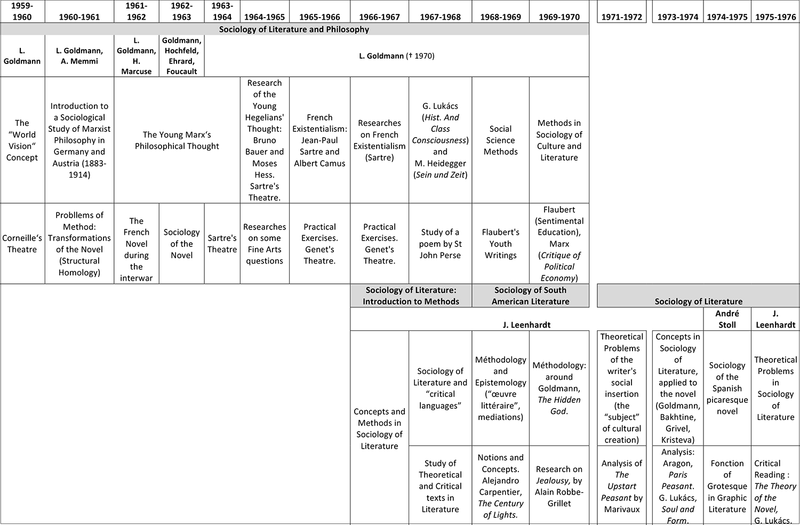 Lastly, Bourdieu’s working groups in Section VI and subsequently at the EHESS and mostly at the ENS Ulm were venues for collective research on literature. Before it gained international exposure, the sociological approach to literature developed by Bourdieu, but also beyond his circle, was primarily implemented, complemented, and discussed by former students, colleagues, and members of these working groups. Beginning in 1966-1967, literature was featured in the curricula in several disciplinary subdivisions. It was occasionally linked to artistic themes, subjected to a variety of theoretical approaches, and addressed in terms of production, diffusion, and interpretation. In Section VI, Goldman’s sociology of literature appeared not to find a place either in sociology or in the emerging pole of scholarship on literature and the arts. To understand the reasons for this lack of disciplinary affiliation, we need to situate it within the broader development of the sociology of literature, which indeed was part of a “wider movement, namely that of sociology’s growing concern for the symbolic dimensions of society” (Dirkx 2000: 37). The emergence of this speciality was encouraged by the creation of a Ministry of Culture in 1959. Studies on photography and museums initiated by Pierre Bourdieu (1965, 1966), Jean Duvignaud’s research on theatre, Raymonde Moulin’s work on art markets as well as Pierre Francastel and close colleagues contributed to this movement, which also materialized with the importation of foreign works19. The sociology of literature had long been torn between two disciplines whose respective developments were at odds (Lepenies 1990)—“too ‘sociological’ for literature scholars and two ‘literary’ for sociologists” (Sapiro 2014). The very instability of the “sociology of literature” label, which sometimes became “literary sociology” (a term used in Gustave Lanson’s work, and on occasion by Lucien Goldmann and Jean Starobinski) or the “sociology of the literary fact” (Escarpit), is a clear sign of its weak institutionalization. In light of its relative flexibility regarding disciplinary distinctions, Section VI was a favourable venue for its development. Yet it did not entirely escape the disciplinary rationales at work in the division of intellectual labour. In the 1960s, the sociology of literature detached itself from historical approaches (especially those of Gustave Lanson and Lucien Febvre) in several ways. In 1960, Robert Escarpit (1918-2000), who was in charge of comparative literature at the University of Bordeaux and an advocate of an empirical sociology of the “literary fact,” created the Centre for the Sociology of Literary Facts in Bordeaux. He received funding from UNESCO, whose book development programmes he then promoted. Having authored the first introduction to the sociology of literature in the famous « Que sais-je ? » collection (1958), he played a key role in the speciality’s initial development in French-speaking spaces (Van Nuijs 2007). Lastly, Marxist approaches to literature, which Sartre explored in the early 1970s, were also key to the work of Goldmann and the promoters of an Althusser-influenced brand of Marxism, who extensively discussed the social dimensions of literary works but did not call themselves sociologists. In his teaching, Goldmann combined the examination of philosophical and theoretical questions and practical sociology of literature research (Table 5). Although emphasis was irregularly placed on studies of philosophy and literature, the two areas remained addressed. Goldmann studied both classic and contemporary works (Corneille, Malraux, Nizan, Drieu La Rochelle, Sartre and existentialism, and Genet). Guests at the seminar included Jean Duvignaud and Henri Lefebvre, both Marxists with ties to the journal L’homme et la société and the working group on the sociology of knowledge, as well as Louis Althusser, Theodor Adorno, Herbert Marcuse, critic Paul Bénichou, author of The New Criticism In France, Serge Doubrovsky, and Roland Barthes. Barthes and Goldmann occasionally collaborated until the mid-1960s: they advised students and pursued intellectual exchanges at the time of the dispute over New Criticism and its resulting alliances, and jointly participated in conferences (such as Brussels 1964 on the sociology of literature). According to the directories, Goldmann’s seminar was regularly attended by around fifteen auditors. Students who went on to pursue literary careers included the Czech-born researcher and scholar Pierre Václav Zima (1946-), who was also a student of Jean Cassou, and who turned to sociological criticism and the analysis of critical theories of literature. Two other students of Goldmann also played a prominent role in the diffusion of structuralist and post-structuralist literary theories: Julia Kristeva, an academic and psychoanalyst with ties to Barthes and the journal Tel Quel, and Sylvère Lotringer, a promoter of French Theory whose more distant relationships with Barthes and Goldmann turned out to be crucial to his training and career. Starting in 1966-1967, Goldmann’s seminar was complemented by a class led by his assistant Jacques Leenhardt20. Leenhardt hoped to “open up a dialogue with certain so-called a-historical theories of literature21.” He published research on the relations between the sociology of literature and structural semantics, and on the Nouveau Roman (the new novel), airing views that clashed with those of the Tel Quel group (Lecture politique du roman, 1973). His seminar, which excluded philosophy and focused on the sociology of literature, illustrated the Goldmannian sociology of literature’s attempt to carve a space for itself in literary criticism. Leenhardt positioned himself in relation to literary criticism—not sociology. He believed it necessary to “help students find their way in the maze of what is commonly called ‘critical languages’” to “clarify the theoretical and epistemological positions on display in each of these languages as precisely as possible.” He found semantics to be a “major empirical confirmation22” for the sociology of literature. Goldmann’s philosophical stance and Leenhardt’s synthesis between internal and external analysis were at odds with Bourdieu’s approach, emphasizing the separation between philosophy and sociology, which was very successful and spread widely. At the same time, the sociology of literature was challenged by the promoters of literary theories. Sociologists of literature, and more broadly advocates of social approaches to literary texts from the French-speaking fields of social science and literary studies, formed a network specific to the “sociology of literature” speciality, which materialized in the form of conferences and occasional collaborations. For them, this network tended to take precedence over their affiliation to sociology and/or literary studies. The network was formed at a distance from the dominant poles in the academic field (Hauchecorne 2011), both at the domestic (Bordeaux, Lille, then Vincennes) and the transnational level. Belgian and Québécois scholars in sociological criticism and the sociology of literature, whose roots lay mostly in literary disciplines, were partners of choice. In other words, this network mostly grew beyond disciplinary and national boundaries. Likewise, Leenhardt’s students, like Goldmann’s, were from different countries. Leenhardt’s career was similarly international: he had ties to Belgium, where Goldmann had directed the Centre for the Sociology of Literature, Hungary, the USA, and Latin America, where plans to set up a centre for research on the sociology of literature failed twice. Lastly, by the late 1960s, Goldmann’s Marxism had been overshadowed by other heterodox approaches, mainly Althusserian approaches and Maoism (Matonti 2005). The combination of the success of literary theories and of these movements led Goldmann’s sociology of literature to be further marginalized—a process amplified in the following years by the decline of Marxist approaches. The SSL subdivision expanded between 1966 and the mid-1970s. While collaborations between Barthes and Goldmann permanently declined, the former collaborated increasingly often with Greimas. In 1966-1967, SSL included eight members (Table 6): Roland Barthes, André Miquel and Georges Dumézil, sinologist Alexis Rygaloff, from the “History and geography” subdivision, Algirdas Julien Greimas, Jean-Claude Gardin, and Jacques Bertin, whose teachings were previously not affiliated with any of the clusters. Note: As class reports are unavailable for the academic years 1970-1971 and 1972-1973, the corresponding columns have been left blank. Two main trends stand out in the subdivision’s early years. First, the increasing proportion taken up by literary themes: they were the subject of Barthes’s seminar beginning in 1967-1968, which led to his semiotic analysis of Balzac’s Sarrasine, S/Z (1970); the same year, Greimas examined narrative structures; then, Jean-Claude Gardin studied the application of automated information processing systems to literary texts and Louis Marin analysed relations between images and texts. In 1969-1970, Roland Barthes was replaced by Gérard Genette, who launched a seminar on “Literary Semiotics,” thus strengthening the focus on literature. A maître de conférences at Section VI in 1967, elected DE in 1972, Genette had by then already published the first two volumes of his Figures (1966, 1969) and was about to distance himself from Tel Quel and create the literary theory journal Poétique in 1970, alongside Hélène Cixous and Tzvetan Todorov. New developments in linguistics were not overlooked—being tackled on courses by Eliséo Veron and Sophie Fisher, François Récanati and, most importantly, Oswald Ducrot. There was a regularly reasserted effort to develop general theoretical approaches to linguistic, literary, and artistic objects drawing on semiology, semiotics, and semantics, which were also taught in the EPRASS. In 1966-1967, Rygaloff claimed that the “issues of definition and conception that arise regarding all types of linguistic unit have mainly been addressed in terms of theory, and only incidentally in terms of applications of the theory to Chinese28.” Greimas sought to “specify the status of theories of language, as well as the nature and organization of the epistemological space they cover29,” in the process encompassing a wide variety of possible applications of studies by “specialists, or semioticians looking to specialize30.” A pole of specialists of language was taking shape, appearing relatively autonomous even though it had fewer members than other disciplinary groups31. The SSL subdivision was built around similar theoretical and methodological approaches applied to varied objects, whereas the Goldmannian sociology of literature was trying to assert its place as a speciality within sociology. The members of SSL were the driving force behind an attempt to bring about a renewal of literary studies around structuralism and the critique of literary teaching in secondary and higher education. Drawing on various appropriations of structural linguistics, Russian formalism, and psychoanalysis, the literary theories developed by this heterogeneous group progressively became specialized in the internal analysis of texts. The eighth issue of Communications on the structural analysis of narratives (1966), writings by Barthes, Genette, Todorov, as well as some works by Greimas that were spread far beyond Section VI were central to this evolution, made possible by the refashioning of literary studies and reinforced by the development of the lettres modernes discipline (French language and literature) in the 1960s and 1970s. Lastly, the group took advantage of the “plurality of rival principles of hierarchization” (Bourdieu 1984: 150 sq.) at work in academic and intellectual spaces: using media connections, forging alliances with literary avant-gardes that combined theory and political and aesthetic radicalism, occasionally participating in teaching initiatives, joining publishing bodies, and so on. The evolution of the SSL subdivision suggests several observations. First, its collective initiative was a success, drawing on a relative paradigmatic consistency and on a range of fairly close theoretical, methodological, and discipline frameworks, at odds with the individual legacy characterizing the Goldmannian sociology of literature. Secondly, two disciplinary paths were pursued—linguistics and literary studies—whereas the Goldmannian sociology of literature was marginalized within the discipline of sociology. Lastly, the initial absence of a disciplinary structure specific to the study of linguistic, literary, and artistic objects in Section VI arguably facilitated the shift from a diffuse network to an established pole formed on the basis of theoretical, academic, and social connections. For some time, oppositions between the inheritors of the early specialists of literature in Section VI manifested themselves under various forms, including intellectual stances and periods of conflict. Ultimately, the generation of the students of Barthes, Goldmann, and Francastel—respectively Gérard Genette and Tzvetan Todorov, and Jacques Leenhardt and Hubert Damisch—grew distant from sociology and in the longer term ended up rallying around the pole of scholars in literature and the arts that was institutionalized at the EHESS under the impetus of the policies aimed at merging CNRS research units. In sociology, the study of the arts and literature was also institutionalized in the following decades, both in laboratories (in 1983, Raymonde Moulin had created the Centre for the Sociology of the Arts, which then became a part of the Raymond Aron Centre for Sociological and Political Studies) and in journals and research groups—for instance with the journal Sociologie de l’Art, launched by the “Sociology of Art” committee of the International Association of French-Language Sociologists (AISLF) (Péquignot 2005). Over the same period, a Bourdieu-inspired strand of the sociology of literature developed within sociology, increasingly pursuing a dialogue with literary studies. These divisions and alliances, which acquired meaning over longer periods of time than what the official chronology of higher education and research may lead us to think, are a further reminder that there is no such thing as an ex nihilo institutional creation; rather there are “recyclings of traces of older collectives, even though creators are wont to forget about them” (Brian & Jaisson 1988: 66). This article has strived to show how rationales of disciplinary (re)configuration and specialization may unfold in a space initially devoid of divisions by discipline but deeply affected by the transformations of academic and intellectual spaces. The evolution of Goldmann’s sociology of literature appears to have suffered from these transformations—only finding a place in the speciality’s own international channels. The evolution of philosophy, which was not within the purview of this paper, contributed to its marginalization. Yet, to avoid “illusory self-sufficiency” (Convert & Heilbron 2005: 20), the evolution of specialities should be understood both within the disciplines and outside them. The sociology of literature is an illustration of this, as it was affected by the institutionalization process of two disciplines—sociology and literary studies. The development of the sociology of literature drew on a structured and hierarchized network that was in some ways experienced and defended as a disciplinary affiliation would have been. The emergence of the SSL subdivision in Section VI appears to have followed an inverse trend. It was paradoxical to the extent that it legitimized and promoted new approaches and a specialization in literary subjects that did not only rely on specialists of literature. In this case, too, the journey of this very small group of intellectual producers stands to gain from being envisioned within broader trends in the academic and intellectual fields. Likewise, their outputs give us some indication as to the crucial role played by the disciplinary reference in their domestic and international success. Indeed, the importance of the question of “literarity” in their studies—the essential organizing principle of literature—and the fact that the literary members of the SSL subdivision focused on theoretical and meta-theoretical outputs that were relatively far removed from pedagogic concerns gave them the prestige attributed to theory in the human and social sciences. The dynamic of this group is in that sense indeed a case of “regression into professional purity” as pinpointed by Andrew Abbott (Abbott 2001: 146), who argued that it was necessarily combined with the diffusion of competing approaches to the object of study and the placement of its agents at the top of the discipline’s hierarchy. 8 Master of Advanced Studies. 12 EHESS archives, Louis Velay papers, file “Rapport Roncayolo (novembre 1968)”. 14 Higher-level competitive examinations for teachers and professors. 24 Interview with Jacques Leenhardt, 5 July 2014. 26 Ibid., and Interview with Annie Goldmann, carried out in collaboration with Quentin Fondu, 2 November 2017. Abbott Andrew (2001). Chaos of Disciplines. Chicago, Chicago University Press. Barthes Roland (1964) . On Racine. English translation by Richard Howard. New York, Hill and Wang. Ben-David Joseph & Collins Randall (1966). “Social Factors in The Origins of a New Science: The Case of Psychology.” American Sociological Review, 31(4): 451-465. Bourdieu Pierre (1969) . “Intellectual Field and Creative Project.” English translation by Sian France. Social science information, 8(2): 89-119. Bourdieu Pierre (1984). “Le champ littéraire. Préalables critiques et principes de méthode.” Lendemains, 36: 5-20. Bourdieu Pierre (1985). “Existe-t-il une littérature belge? Limites d’un champ et frontières politiques.” Études de lettres, 4: 3-6. Bourdieu Pierre (1987) . “The Invention of the Artist’s Life.” English translation by Erec R. Koch. Yale French Studies, 73: 75-103. Bourdieu Pierre (1988) . Homo Academicus. English translation by Peter Collier. Cambridge, Polity Press. Bourdieu Pierre (1991). “Le champ littéraire.” Actes de la recherche en sciences sociales, 89: 3-46. Bourdieu Pierre (1993) . “The Market of Symbolic Goods.” In Bourdieu Pierre. The Field of Cultural Production: Essays on Art and Literature. New York, Columbia University Press: 112-141. Bourdieu Pierre (1994) . Sociology in Question. English translation by Richard Nice. London, Sage. Bourdieu Pierre (1996) . The Rules of Art. 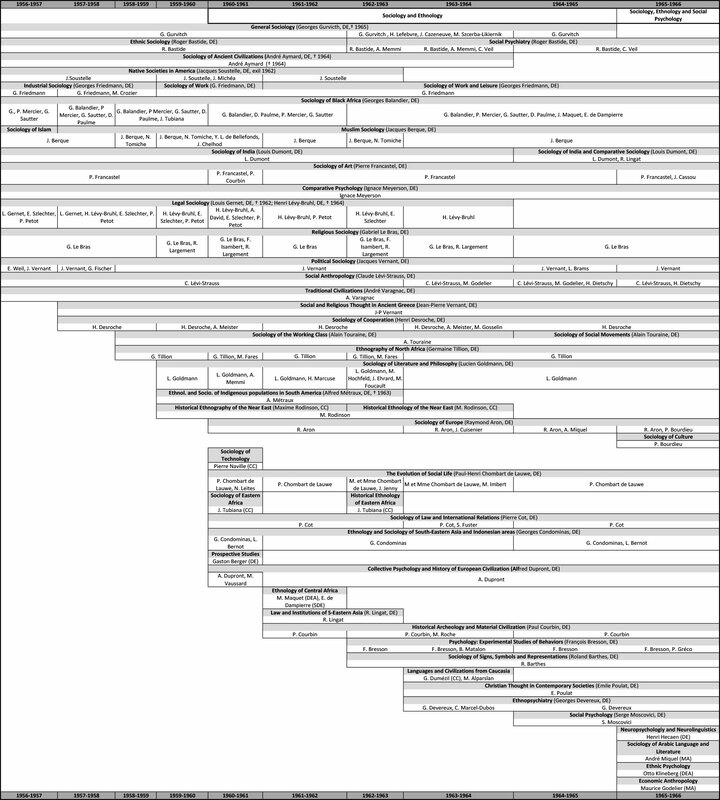 Genesis and Structure of the Literary Field. English translation by Susan Emmanuel. Cambridge, Polity Press. Bourdieu Pierre (2004) . Science of Science and Reflexivity. English translation by Richard Nice. Chicago, University of Chicago Press. Brian Éric & Jaisson Marie (1988). “Unités et identités: Notes sur l’accumulation scientifique.” Actes de la recherche en sciences sociales, 74: 66-75. Callu Agnès (2011). Gaëtan Picon, 1915-1976: esthétique et culture. Paris, Honoré Champion. Cardon-Quint Clémence (2015). Des lettres au français. Une discipline à l’heure de la démocratisation (1945-1981). Rennes, Presses universitaires de Rennes. Chevalier Jean-Claude & Encrevé Pierre (2006). Combats pour la linguistique de Martinet à Kristeva : essai de dramaturgie épistémologique. Lyon, ENS Éditions. Compagnon Antoine (1983). La Troisième République des lettres: de Flaubert à Proust. Paris, Seuil. Convert Bernard & Heilbron Johan (2007) . “Where did the New Economic Sociology come from?”. English translation by Amy Jacobs. Theory and society, 36(1): 31-54. Dirkx Paul (2000). Sociologie de la littérature. Paris, Armand Colin. Dormoy-Rajramanan Christelle (2017). “L’institutionnalisation de domaines d’études pluridisciplinaires autour de 68.” Revue d’anthropologie des connaissances, 11(3): 351-377. Drouard Alain (1982). “Réflexions sur une chronologie: le développement des sciences sociales en France de 1945 à la fin des années soixante.” Revue française de sociologie, 23(1): 55-85. Feuerhahn Wolf (ed.) (2017). La Politique des chaires au Collège de France. Paris, Collège de France/Les Belles Lettres. Genette Gérard (1966). Figures. Paris, Seuil. Genette Gérard (1982) [1966-1969]. Figures of Literary Discourse. English translation by Alan Sheridan. New York, Columbia University Press. Godechot Olivier (2011). “La formation des relations académiques au sein de l’EHESS.” Histoire et mesure, 26(2): 223-260. Goldmann Lucien (1964) . The Hidden God: a Study of Tragic Vision in the Pensees of Pascal and the Tragedies of Racine. English translation by Philip Thody. London, Routledge. Hauchecorne Mathieu (2011). “Le polycentrisme des marges. Les ‘filières’ belge et québécoise d’importation de la philosophie politique étasunienne contemporaine en France.” Histoire@Politique 15: 90-109. Hauchecorne Mathieu (2016). “Essor et disciplinarisation des sciences sociales.” In Jeanpierre Laurent, Charle Christophe (eds). La Vie intellectuelle en France, II. Paris, Seuil: 565-589. Heilbron Johan (2004). “A Regime of Disciplines: Toward a Historical Sociology of Disciplinary Knowledge.” In Camic Charles, Joas Hans (eds.). The Dialogical Turn:New Roles for Sociology in the Postdisciplinary Age. Lanham, Rowman & Littlefield: 23-42. Heilbron Johan (2015). French Sociology. Ithaca and London, Cornell University Press. Karady Victor (1976). “Durkheim, les sciences sociales et l’Université: bilan d’un semi-échec.” Revue française de sociologie, 17(2): 267-311. Kauppi Niilo (1996). “Approach or Discipline? The Field of Semiology/Semiotics in France in the 1960s and 1970s.” The European Legacy, 1(4): 1484-1489. Lamy Jérôme & Saint-Martin Arnaud (2011). “Pratiques et collectifs de la science en régimes Note critique.” Revue d’histoire des sciences, 64(2): 377-389. Lepenies Wolf (1990). Les Trois Cultures. Entre science et littérature, l’avènement de la sociologie. Paris, Éditions de la Maison des sciences de l’homme. Martin Jean-Pierre (ed.) (2010). Bourdieu et la littérature. Nantes, Éditions Cécile Defaut. Matonti Frédérique (2005). Intellectuels communistes. Essai sur l’obéissance politique. La Nouvelle Critique (1967-1980). Paris, La Découverte. Mazon Brigitte (1988). Aux origines de l’École des hautes études en sciences sociales: le rôle du mécénat américain 1920-1960. Paris, Cerf. Pequignot Bruno (2005). 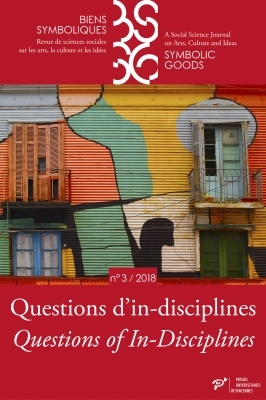 “La sociologie de l’art et de la culture en France: un état des lieux.” Sociedade e Estado 20(2). Picard Jean-François (1990). La République des savants: la recherche française et le CNRS. Paris, Flammarion. Popa Ioana (2015). “Aires culturelles et recompositions (inter)disciplinaires: la 6e section de l’EPHE et les études sur l’espace russe, soviétique et est-européen.” Actes de la recherche en sciences sociales, 210: 60-81. Revel Jacques & Wachtel Nathan (eds.) (1996). Une école pour les sciences sociales: de la VIe Section à l’École des hautes études en sciences sociales. Paris, Cerf/ Éditions de l’EHESS. Samoyault Tiphaine (2015). Roland Barthes. Paris, Seuil. Sapiro Gisèle (2004). “Défense et illustration de ‘l’honnête homme’. Les hommes de lettres contre la sociologie.” Actes de la recherche en sciences sociales, 153: 11-27. Sapiro Gisèle (2014). La Sociologie de la littérature. Paris, La Découverte. Sapiro Gisèle (2017). “Champ.” Politika. [On line]. https://www.politika.io/fr/notice/champ [accessed on 8 december 2017]. Soulié Charles (2012). “La recomposition des facultés et disciplines dans l’Université française des années 1960.” In Soulié Charles (ed.). Un mythe à détruire? Vincennes fac ouverte à tous. Saint-Denis, Presses universitaires de Vincennes, 31-60. Van Nuijs Laurence (2007). “La sociologie de la littérature selon Escarpit. Structure, évolution et ambiguïtés d’un programme de recherche.” Poétique 149: 107-127. 1 The author wishes to thank Jérémy Sinigaglia, Adrien Thibault, Julien Duval and Mathieu Pastor for patiently proofreading and commenting on several drafts of this paper, as well as Jean-Yves Bart for the translation. 2 The collation des grades is the procedure through which the national degrees awarded by some higher education institutions give access to academic degrees after a validation by the state or its representatives (currently baccalauréat, bachelor, master’s, PhD). The procedure requires institutions to comply with national frameworks for higher education and adjust their courses accordingly. 3 See for instance Fernand Braudel’s project of creating a “Faculty of economic, social and political sciences.” EHESS archives, Louis Velay papers, file “Projet de création d’une Faculté des sciences humaines et sociales (juin 1958).” On that project’s failure and the subsequent investment into the MSH, see Mazon 1988. 4 Fouchet’s reform terminated preparatory courses and introduced discipline distinctions at an earlier stage of higher education. Among other changes, it created the University Institutes of Technology (IUT), the DEUG (General Academic Studies Degree, first two years) and the licence/maîtrise alternative at graduate level. See decree no. 66-412 of 22 June 1966. 5 The Higher Education Orientation Act or Faure Act reformed the administrative structure of universities (the representativeness of some decision-making bodies, financial autonomy, the status of the universities and staff) and replaced faculties with UERs (Teaching and Research Units. See act no. 68-978 of 12 November 1968. 6 The so-called “non cumulative” directeurs d’études (DEs), meaning those who mainly taught in Section VI—especially at the CNRS—, initially made up a third of the institution’s teaching staff; the two remaining thirds were “cumulative” DEs, principally employed by another institution and only teaching at Section VI as a supplement to their main activity (Heilbron 2015: 150). According to the “Project for enhancing the careers of non-cumulating directeurs d’études at the École pratique des hautes études,” the “non-cumulative” DEs made up nearly half of the entire Section VI teaching staff as of 1 June 1966. EHESS archives, Louis Velay papers, file “Position de l’école dans la recherche” (1966). See also Revel & Wachtel 1996: 22. 10 Lanson established literary history as a discipline at the Nouvelle Sorbonne at the turn of the twentieth century. In his view, literary criticism needed to “return work to its conditions of production, taking into account not only the author but also the society of the time and the work’s initial reception” (Sapiro 2014: 14). This agenda resonated widely, and its promoters rallied around the Revue d’histoire littéraire de la France, founded in 1894, which helped further this approach in teaching. 11 The discipline grew during that decade: the Revue française de sociologie was created in 1960, and economic and social science classes were introduced into high schools in 1966. A “Sociology and Demography” section was introduced in the Consultative Council of Universities (CCU, the predecessor of today’s National Council of Universities, known as CNU) in 1969. 13 It would be tempting to see the construction of the SSL subdivision, if not the development of sociology, as a case of innovation through the “hybridization of roles.” Indeed, semiology could be read, after some of its promoters in the “Sociology and Ethnology” left for SSL, as an attempt to “[fit] the methods and techniques of the old role to the materials of the new one, with the deliberate purpose of creating a new role” (Ben-David & Collins 1966: 459). Yet an intra-institutional interpretation, focused on discipline labels, seems exceedingly limiting in this case. Barthes was only briefly affiliated with sociology and his semiology drew from the history of mentalities rather than from sociological works. The researchers who joined him in SSL came from other disciplines (linguistics, literary studies, etc.). The idea of a shift from one discipline to another deserves nuancing, as several disciplinary traditions and methods were reformulated in semiology. 15 The literary critics Georges Poulet, Jean Starobinksi, and Jean-Pierre Richard, and to a lesser extent Jean Rousset, Marcel Raymond and Albert Béguin, were sometimes collectively described by that label, which referred to a variety of adaptations of a mix of structural linguistics, phenomenology, and psychology, emphasizing the experimental dimension of literature and its relation to consciousness. 19 Erwin Panofsky’s Gothic Architecture and Scholasticism and of Richard Hoggart’s The Uses of Literacy were respectively published in 1967 and 1970 by Éditions de Minuit, in Pierre Bourdieu’s collection “Le sens commun.” In the same collection, texts displaying a variety of approaches to the study of literature and the arts were later published (such as Adorno’s Mahler in 1976), as well as work by key authors in the development of semiology and literary theories (Émile Benveniste and Mikhail Bakhtin), by others from the SSL subdivision (Oswald Ducrot and Louis Marin), and Georges Mounin’s Introduction à la sémiologie (1970). 20 Born in Geneva in 1942, Jacques Leenhardt had previously worked with Jean Piaget. He studied philosophy and then sociology in Paris. After considering a thesis supervised by Henri Lefebvre on the “sociology of invention,” he enrolled on a thesis with Goldmann, which he completed with Barthes in 1972 after Goldmann had passed away. 23 One was Michael Löwy, who wrote on literature on several occasions. He also co-authored an introduction to Goldmann’s thinking alongside Sami Naïr (Lucien Goldmann ou la dialectique de la totalité, 1973). 31 Godechot shows that between 1971 and 1975, members of the SSL subdivision were somewhat isolated—except for Barthes—and only collaborated with members from other disciplines in terms of doctoral adjudication (Godechot 2011: 11).